At Chappell Roofing, located right here, in the Permian Basin, we understand how the West Texas wind can make keeping your roof healthy a challenge. Regular, sustained, driving winds bear down upon our homes, and expose any weakness. How can you maintain your roof in severe conditions? Start by developing a better understanding the type of roof you have on your home. Different products are designed to wear differently, and they require varying maintenance schedules. If you aren’t sure how long you can expect your current roof to last, given its current condition, or you’d like recommendations about the best type of roof for your house, contact us. For more information about the types of roofs we offer, visit our Roofing Products and Services page. Especially after significant winds or a storm, taking the time to inspect for damage to your roof is critical to heading off roofing issues before a bigger problem develops. Examining the inside of your home for any water staining is an excellent first step, but even if the interior of your home remains dry, your roof may have sustained damage that requires action. Check for missing roofing material, inspect for damage near areas that contain flashing, and make sure your gutters are functioning properly. If you’re not sure what to look for, we’re happy to schedule a roof inspection for you. For more information, visit our What to do After a Stormpage. If our roofs are not adequately ventilated, hot, humid air gets trapped in our attics. In West Texas, the climate causes this superheated air to prematurely age our roofs, increasing our likelihood of roof failure in severe weather. At Chappell Roofing, we appreciate the importance of proper roof ventilation, and we offer many ventilation alternatives to address this roofing need. Visit our Ventilation page to understand more about the damage caused to roofs by improper ventilation and to learn more about the best ventilation options for your home’s roof. A great roof is an essential investment, and integral to your home’s value. 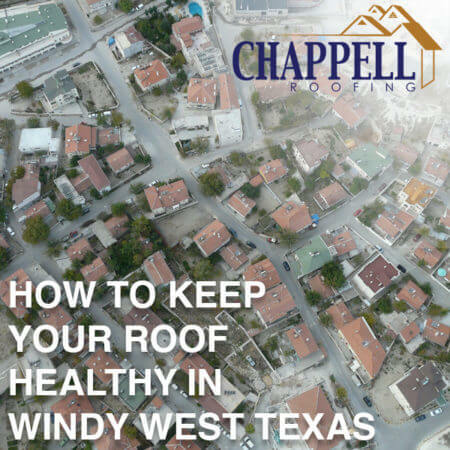 Though the West Texas wind is tough on our roofs, Chappell Roofing will help you keep your roof healthy, functional, and beautiful. Contact us today for your roof repair or replacement!